The Museum of Architecture and Design is launching an open call for participation in the 26th Biennial of Design, BIO 26 – Common Knowledge, curated by Austrian design curator and cultural producer Thomas Geisler together with assistant curator Aline Lara Rezende. BIO 26 will take on one of the greatest challenges of our time: information. Concerned with the widespread crisis in information, BIO26 seeks to harvest the best ideas that explore ways to creatively take charge and react to it, as well as to propose experiments and present alternatives to the ways we currently deal with information and knowledge. This year we will commission six projects for the biennial through a designathon process—a three-day intensive, hands-on, sprint event in which curious and motivated people, non-designers and designers alike, will collaborate on design challenges. Selected participants will explore real challenges posed by the BIO26 curatorial team together with a partnering museum, library, university, botanical garden, and retirement home, as well as news and media organization to rethink their roles in the twenty-first century. Six esteemed designers will lead the groups as mentors until the exhibition presentation. After choosing a challenge, the selected participants will actively join the first of two designathons taking place in May in Ljubljana. The six best projects selected during the first designathon—ideation to prototype—will continue to the next phase and receive funds to be developed further in a second designathon—prototype to product—taking place in July in Ljubljana. 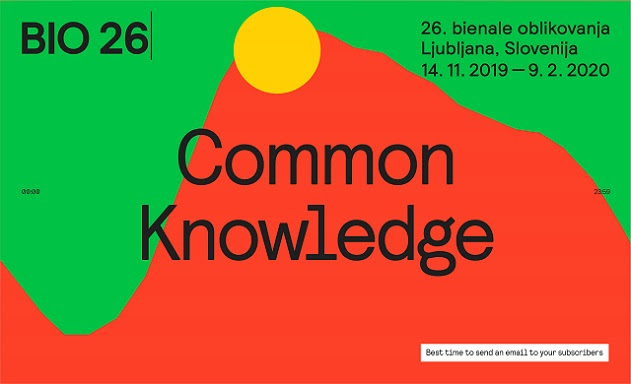 From 14 November 2019 to 9 February 2020 in Ljubljana, the 26th Biennial of Design, BIO 26 – Common Knowledge, will present the outcomes of the exploratory work of the winning challenges at various locations in Ljubljana, complementing the main exhibition at MAO and accompanied by a special catalogue. Learn more about the designathon process and the BIO26 – Common Knowledge theme on our website.